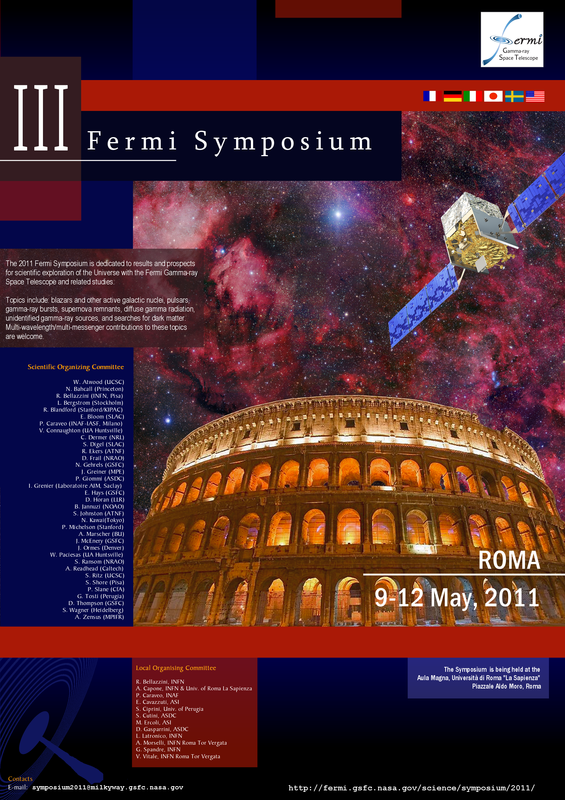 The 2011 Fermi Symposium is dedicated to results and prospects for scientific exploration of the Universe with the Fermi Gamma-ray Space Telescope and related studies. Topics include: blazars and other active galactic nuclei, pulsars, gamma-ray bursts, supernova remnants, diffuse gamma radiation, unidentified gamma-ray sources, and searches for dark matter. Multi-wavelength/multi-messenger contributions to these topics are welcome. The meeting will be held in Rome, Italy. The program will include invited talks, contributed talks, and posters. March 20 - Abstract deadline. April 11 - Last day for reduced registration fee. April 15 - Last day hotel availability guaranteed. May 8 - Registration and poster set-up. May 9 - First day of the Symposium. Vatican tour. May 11 - Symposium banquet. The registration includes breaks, lunches, the Vatican tour, and the banquet. Accredited media are offered complimentary registration to the 2011 Fermi Science Symposium. Please contact Lynn Cominsky for details.